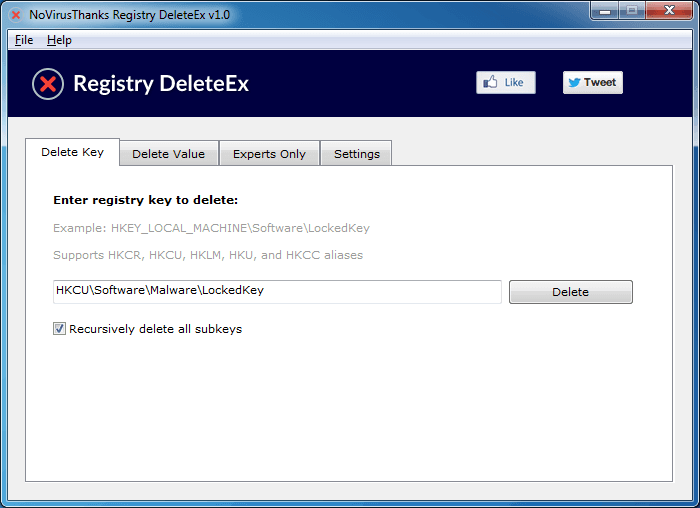 Registry DeleteEx is a small Windows OS software application that can delete locked registry keys and locked registry values via a kernel-mode driver. Some malware may lock/protect registry keys by changing the registry permissions or by using API hooking techniques. With this little tool you can successfully delete almost any registry key and value that can’t be deleted with Regedit or via traditional methods. Use this tool with caution, if you delete system registry entries your PC will be unbootable. Delete locked registry keys and values that show errors like “Cannot delete registry key” or “Error while deleting registry key”. It’s very frustrating when you encounter “locked” keys/values because they absolutely refuse to be deleted, even in cases when you run as Admin and even take ownership of the key itself. Regardless of security permissions in place, this tool can effortlessly delete locked registry keys and values. Effectively delete locked registry keys and locked registry values. You can also recursively delete all registry subkeys (and all values found). 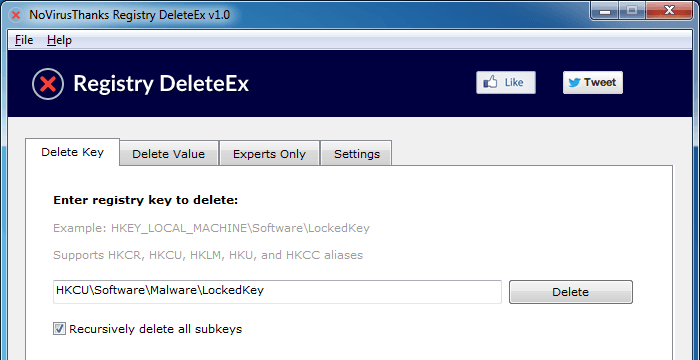 This tool can be used to delete registry entries locked by malware or rootkits.